on coronary heart disease deaths on a county-by-county level. those counties that has implications for heart disease risk. ﻿Twitter has broken news stories, launched and ended careers, started social movements and toppled governments, all by being an easy, direct and immediate way for people to share what's on their minds. Researchers have now shown that the social media platform has another use: Twitter can serve as a dashboard indicator of a community's psychological well being and can predict rates of heart disease. The study was published in the journal Psychological Science. Previous studies have identified many factors that contribute to the risk of heart disease: traditional ones, like low income or smoking but also psychological ones, like stress. 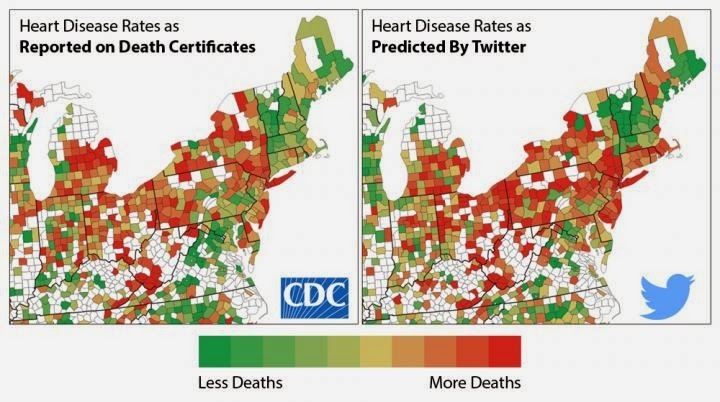 The researchers demonstrated that Twitter can capture more information about heart disease risk than many traditional factors combined, as it also characterizes the psychological atmosphere of a community. They found that expressions of negative emotions such as anger, stress and fatigue in a county's tweets were associated with higher heart disease risk. On the other hand, positive emotions like excitement and optimism were associated with lower risk. The relationship between language and mortality is surprising, since the people tweeting angry words and topics are in general not the ones dying of heart disease. But it means if many of your neighbors are angry, you are more likely to die of heart disease. This finding fits into existing sociological research that suggests that the combined characteristics of communities can be more predictive of physical health than the reports of any one individual. The researchers believe that they are picking up more long-term characteristics of communities. They can't predict the number of heart attacks a county will have in a given timeframe, but the language may reveal places to intervene. Twitter seems to capture a lot of the same information that you get from health and demographic indicators, but it also adds something extra. So predictions from Twitter can actually be more accurate than using a set of traditional variables, the researchers conclude. Based on material originally posted by University of Pennsylvania.